Existing evidence for Alzheimer's disease and related dementias suggests that there are significant differences in prevalence, incidence, treatment, and mortality of Alzheimer's disease across racial and ethnic groups. There are also substantial differences in participation in clinical trials, the use of services, and disease-related expenditures. Disparities across racial and ethnic groups in diagnosis and treatment rates and in the use of services are concerns from an ethical and policy perspective. In an ideal world, the burden of disease and access to services would not vary based on a person's race or ethnic background. As the population ages and minorities become a higher proportion of the older population, a higher percentage of people with Alzheimer's disease will be minorities. Among the population aged 85 and older, which is the age group most likely to have Alzheimer's disease, the proportion of the population that is White is projected to decline from 90% in 2010 to 81% in 2050 (Vincent & Velkoff, 2010). The proportion of the 85 and older population that is non-Hispanic White is projected to decline from 85% in 2010 to 67% in 2050. During the same time period, the proprtion of the population aged 85 and older that is Hispanic is projected to increase from 5% to 15%. 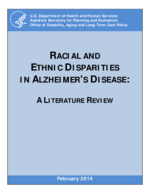 This research report describes evidence from the literature of racial and ethnic disparities in Alzheimer's disease, explores possible reasons for these disparities, and reviews interventions that have attempted to reduce disparities in this population.